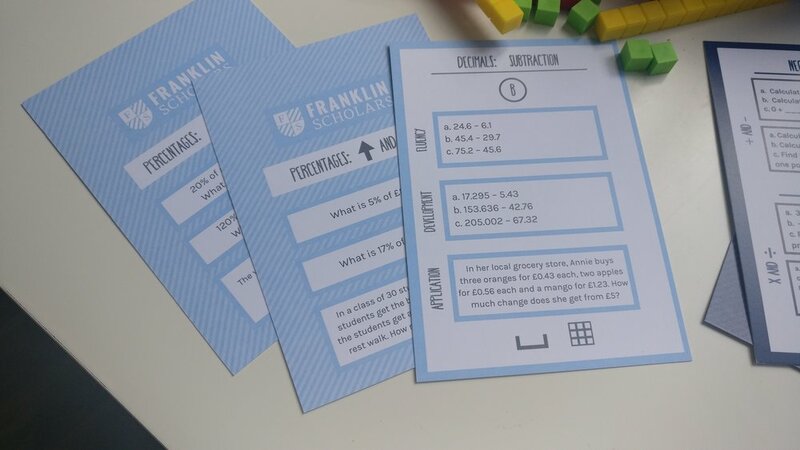 Franklin Scholars successfully pilots our new numeracy programme! Great news! Over the last year, Franklin Scholars conducted a pilot to integrate numeracy into our beacon peer-mentoring programme. Funded by Nesta and Tata under their Math’s Mission Project, and with the help of three partner schools, we have been able to develop a unique, year-long numeracy curriculum that seamlessly integrates into our existing peer mentoring model. The development of a new curriculum has been no easy feat. From ensuring that best practice is followed, to researching the maths curriculum, we have worked hard to ensure that the programme not only makes maths fun, but does so in a way that aligns with a number of broad educational objectives. This iterative process has been assisted through consultation with a range of maths consultants and teachers, ensuring that our resources to take advantage of cognitive load theory, and the mastery of number. We approached our pilot with great optimism, remembering the many lessons learned from our previous work with schools. Initial results from the pilot programmes are promising and showing positive impacts on student progression (preliminary impact results to be published in our next impact report!). In addition, these pilot programmes have helped us understand how schools may need additional and different support in the implementation of our numeracy curriculum, as opposed to the literacy programme. One great surprise has been the ease with which students were able to put energy behind the numeracy elements of the programme. From the outset, we knew that mindsets and attitudes towards the subject were a potential challenge. This was supported by our experiences of mentor training, where many stigmas and misconceptions were brought into the programme by students. But in actual fact, mentors seem to have been able to build a really productive learning environment, which is really promising! Looking forward, we are excited to have received additional funding from Nesta to continue the roll-out of our numeracy programme, which will begin in early 2019. Interested in working with us? Check out our programmes page and contact us to have a chat!